—To distribute the remuneration to the rightowners. activities for protection of copyright and neighboring rights. (1) To set the tariff for the remuneration concerning home taping and to exercise the right to collect and distribute the remuneration or to help carry out the activities involved. (2) To make popular the concept of copyright, to do research and study for this purpose or to help carry out the activities involved. (3) To promote the creation of works and to spread them, or to help carry out the activities involved. (4) To cooperate with international organizations for the protection of copyright and neighboring rights, or to help carry out the activities involved. (5) To do research and study on technical security system against illegal reproductions, which are in need of the development of the digital machine and medium, or to help carry out the activities involved. 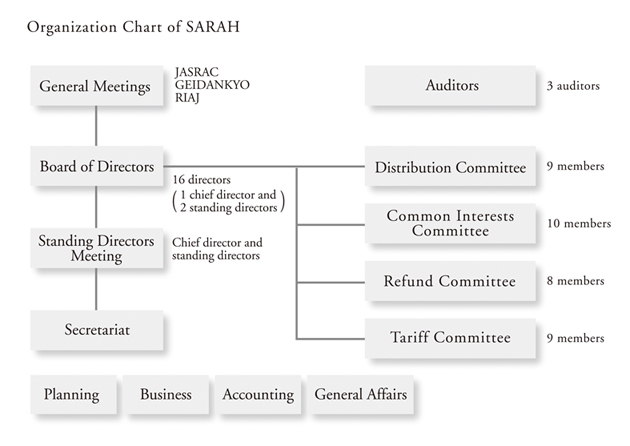 (6) Other activities in need of achieving the purpose of sarah.